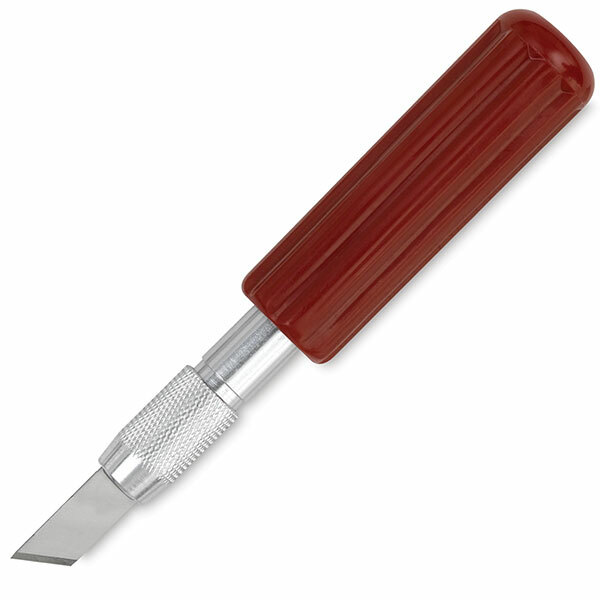 A 4¼" plastic grip handle with a #19 blade. Also takes #2 blade, #15 through #26 blades, and #28 blade. #18 — 1/2" chisel for deep cross cuts and paint scraping. Fits #2 and #5 knives. #26 — Carving blade for whittling and general woodcarving. Fits #2 or #5 knives. #24 — Close corner cuts for templates, mats, deburring, and trimming. Fits #2 and #5 knives. Available for bulk purchase. #23 — Double-edge for close quarter, angled corners, stripping. Fits #2 and #5 knives. #22 — For general shaping, whittling, trimming. Fits #2 and #5 knives. #25 — General carving, whittling, heavy cutting. Fits #2 and #5 knives. #28 — Hooked for curved shaping, whittling, leather carving, lino cutting, etc. Fits #2 and #5 knives. #15 — Keyhole blade for interior cuts on soft wood, foam, and plastic. Fits #2 and #5 knives. #2 — Larger version of #11 blade, designed for use with #2 or #5 knives. Sharp angle for precision cutting of medium to heavy-weight materials. Available for bulk purchase or in a safety dispenser package. X-Life Blades — The blades in this line are designed for extended life, maximum performance, and superior sharpness. Each X-Life blade is oxidized to preserve its edge and to prevent rusting. Available in #11 and #24 styles.